Hey everyone! Next week will be a bit crazy around home base with both ske7ch and myself out of town for various recon missions, so we thought we’d take the chance to drop a quick Update this week instead of next. With all the mileage we’re racking up these next couple months, regular editions will definitely be catch-as-catch-can. 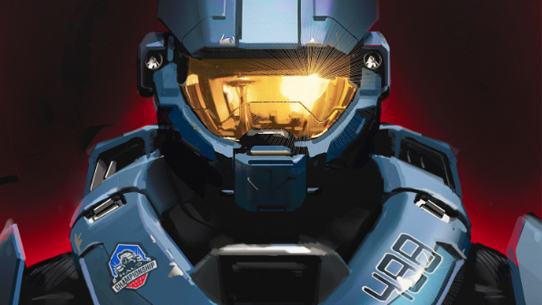 Regardless, this week we’re rounding up some rad happenings going on around our favorite franchise, from new MCC update deets to HaloWC info, additional awesome content from the community itself, and more. Let’s dive in! This week we announced a new comic mini-series with our friends at Dark Horse. Halo: Collateral Damage is a new Master Chief story that focuses on Halo’s most iconic hero (and recent birthday boy!) and some of his untold exploits during humanity’s war with the Covenant. For a few more details, check out the announce blog HERE. However, that’s not the only little narrative nugget we’ve got for you today (I mean c’mon, look who you’re talking to). Many of you might remember our cover art reveal of the upcoming Halo: Bad Blood by Matt Forbeck back in Canon Fodder Issue 100. Today we’re excited to share the story synopsis with eager fiction fans. Interested? Thought so. A secret mission enacted by the Office of Naval Intelligence could possibly help turn the tide, and has Buck reluctantly agreeing to reform his old team, Alpha-Nine. Because if the band is really getting back together for this one, that means everybody—including the Spartan who Buck never wants to see again, the one who committed the ultimate betrayal of trust…. 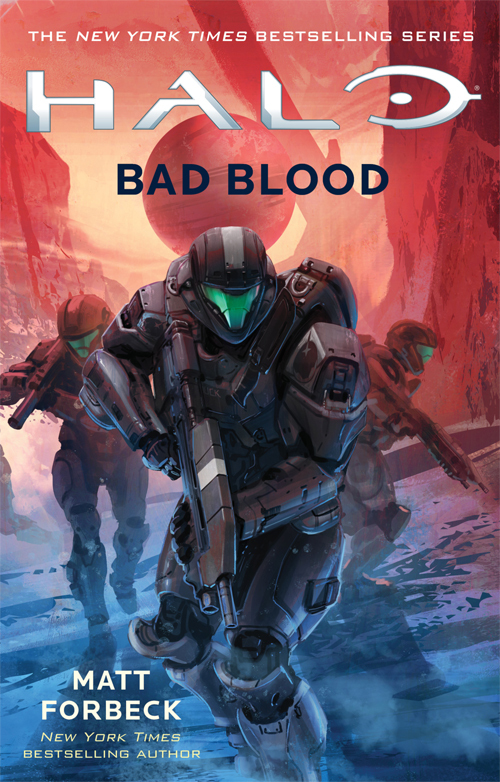 Halo: Bad Blood is slated to hit store shelves and digital drives on June 26. Yesterday, our dear ske7ch dove into the development foxholes with the Legac- err, Publishing Team, all of whom are tirelessly hard at work churning away at evaluating and testing updates to the Master Chief Collection, with the aim of turning it into the timeless treasure-trove of Halo happiness it deserves to be. Lots of things are discussed, including information on flighting, feature requests, answers to some frequently asked community queries and more. For the full skinny, make sure you check out the full feature HERE. Plus, the more you click on things, the cooler our website becomes to the internet. 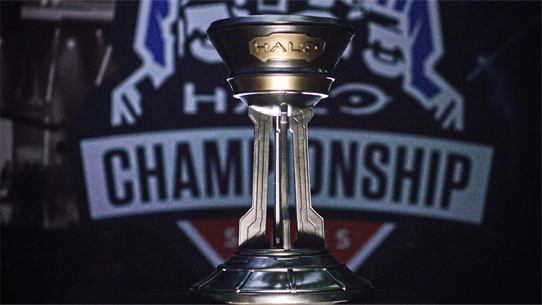 The Halo World Championship continues to power through its globe-trotting tour, with the HaloWC 2018 Sydney Finals next up on the docket. The finest fireteams in the Australia-New Zealand region will be battling it out for the chance to earn a spot in Seattle’s big show come April. Of course, the $20k prize pool for this weekend’s tournament doesn’t hurt either. With the action taking place down under, this weekend’s festivities are fittingly taking place in the future as far as we’re concerned, so the action kicks off today for those of us in the US, seeing as it’s already Friday in Australia. The fourth dimension is weird, yo. You can get all the details on the Sydney Finals in our official preview, and catch all the action live at mixer.com/Halo, twitch.tv/Halo, and live.twitter.com/Halo. And don't forget, right after Australia the tour heads to Mexico City for the HaloWC 2018 Mexico City Finals, an open regional final where any competing team from Latin America can register to play, and taking the top spot will earn you a trip to the HaloWC Finals in Seattle. For more details, check out our Mexico City Event Hub. And it doesn’t stop there, following Mexico City (March 17-18) is the Columbus Finals (March 23-25), and then the big one, the HaloWC 2018 Finals in Seattle at the Century Link Event Center on April 13-15. Get hyped! Recently, 343 denizens Tyler “Postums” Davis and Matthew “Wrensi” Jordan have been doing some incredible work within the Halo Wars 2 community, helping both gather feedback and answer questions as well as work behind the scenes to try and implement new balance adjustments and quality-of-life improvements for the Halo strategy experience. In addition, they’ve also joined us in efforts to evolve the competitive HW2 scene, as we continue to look at ways to not just highlight many of the awesome community-curated competitions going on, but also through official tournaments online with the Xbox Arena feature. Let’s hear from the guys on some of the things they’ve been seeing. We can’t believe it has been already a week since the last update with how many new things we are working on right now. In this past week Wrensi and myself have been heads-down working on the next balance update which you can check out the preview of over in the Halo Wars 2 forums here. Please look and weigh in on what you like, dislike, and discuss what these changes mean to the game. We are always checking the thread to hear what the fans want to see happen to the game and we are constantly trying to iterate on it and help balance the game in the best ways possible. We don’t have a date yet for when it will come out, but more news is coming soon. Moving on from balance stuff the community and 343 have a LOT going on in the world of tournaments and competition. In last week’s update we discussed the finals for Omega Team’s Alpha tournament which was wrapping up on Friday. It was an exciting series of matches to watch! In great competitive fashion the games went all the way to Game 5 with both teams putting every ounce of effort they had trying to take win. In Game 5 it was PoisonHearted54 playing as Colony and rdsxfan2k7 playing as Forge going up against NebaXxX as Anders and Ex0 KAB00M who was playing Isabel. I won’t spoil the team who was victorious but I will say a big congrats to everyone that played in the tournament and say to the winners that the 343-sponsored prizes have been shipped out and the goodies are on their way! To find out who won you can catch the final matches on Twitch at the Omega Team’s Twitch Channel here. To this weekend’s news there are some great things planned in the competitive area with a lot of fun tournaments that being driven by different parts of our diverse community. The fine people over at Breaking the Clutch are hosting a series of tournaments that will be going on every other weekend into the summer. I’m going to be quiet for a minute and let you all browse some info straight from them about these tournaments directly from the eLeague organizer himself over at Breaking the Clutch, The Hosticide. Thank you Hosticide! You can also catch more of what Breaking The Clutch is all about online at Twitter and YouTube. They have a 1v1 deathmatch tournament going on March 10 and is most definitely worth checking out as well. This one has 4 spots left at the time of writing this, so definitely hurry up if you want to get in on it. In talking with Andrew from Team Respawn he had to say, “For people to sign up, they can send me a message on XBL (xandy92) or tweet them @TeamRespawnTV. If you are interested in purely joining forces with more members in the Halo Wars community, check out there Xbox Live Club - Halo Wars Nation or some of the awesome content they are creating over on YouTube. In the spirit of competitiveness and working with the community we here at 343 are also spinning up tournaments now on a regular cadence. 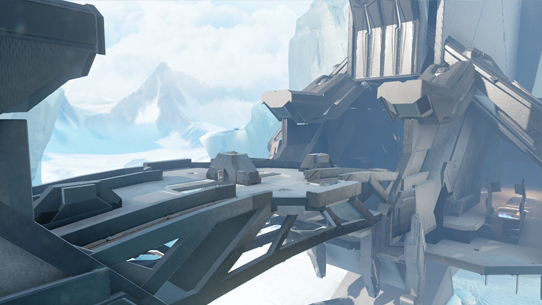 If you want to get in on the action now please check out the official thread on Halo Waypoint here. The next one we have on the books is Saturday, March 17and is a 1v1 single elimination deathmatch on Rift for 64 players who want to go head to head for bragging rights. But keep your eyes peeled as we have some fun things in the works behind Halo Wars 2 and future tournaments! With each passing week I look forward to the amazing things our community is coming up with and the cool things they are making happen. Thank you to all the fans that come to Halo Waypoint forums and openly leave valuable feedback. We are listening and can’t wait to hear more from you so that we can keep shaping the game to what the fans want! Best of luck in the tournaments this weekend to everyone and we will see you in game soon! Thanks guys! Also, if you’re interested in giving feedback on Halo Wars 2 or suggestions for various improvements, don’t forget to check out the official feedback thread on the Halo Waypoint forums so you can make your voice heard. The next tournament is Saturday, March 17and is a 1v1 single elimination Deathmatch on Rift with 64 spots open - get online and get signed up today! We’ve discussed a few times over the past couple of Community Updates work being done on Halo 5 to address some big fixes and balance issues. Earlier this week a new update was rolled out and you can get all the details in our patch notes thread on the Waypoint forums. In addition, the team has done some knob-turning to improve player experience in the H3 Classic Throwback playlist, adjusting the map & mode combinations that you’re able to encounter. This is a direct result of both player feedback and even just getting more games under the belt ourselves. Hop in and see what you think! And don't forget, the more you play, the (likely) longer it might stay. We’ve got more heroic community efforts to highlight in this week’s Spotlight, and we kick things off with a shout out to a very special community of our own! Love this iconic Sangheili zealot render from Rookie 425. Another sweet render, this time from HogInfinity. Hakuru15 has been doing really cool breakdowns comparing visuals from Halo 2 and Halo 2: Anniversary. It’s awesome and you should check it out! To give you a head start, here’s PART 2 and PART 3 of their exploration. Love this local (Seattle) shout out to some kickass cosplayers! Apeman117 received this obvious omen of true love from his lovely. I'd say they're off to a great start! Stickerboy stopped by to share some great shots of the HaloWC 2018 London Finals! Continuing with our Chief-related theme going on today, the YouTube channel MediumGreySky has some incredible environmental montages from Halo 3, Halo 2: Anniversary, and Halo 5: Guardians that might just bring a tear to your eye. Never Forget indeed. 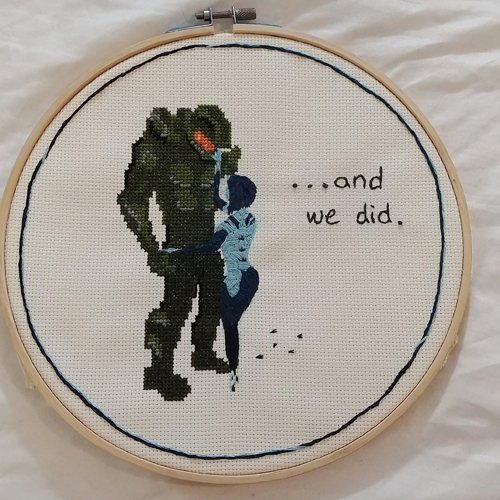 Until next time… Live well, play Halo, and hail to the Chief. Hey everyone! We’re back with a brief catch-up as we descend into the metaphorical maelstrom of the Halo World Championship 2018 Finals. We’ve got a few different things to focus on before most of us head off to the venue downtown for all the esports action that begins tomorrow. Have I mentioned how nice it is to have it all happen on home turf? Yeah, it’s super nice. And with that, let’s begin! Hey everyone! It’s about that time again, eh? It’s been a couple weeks since our last readable rendezvous, and a fairly-packed fourteen Terran rotations it’s been. From inside info on new lore to an evolved take on some high-stakes matchmaking, there’s plenty to cover. Oh, and a new Halo World Champion was crowned. No big deal. Let’s dive in, shall we?